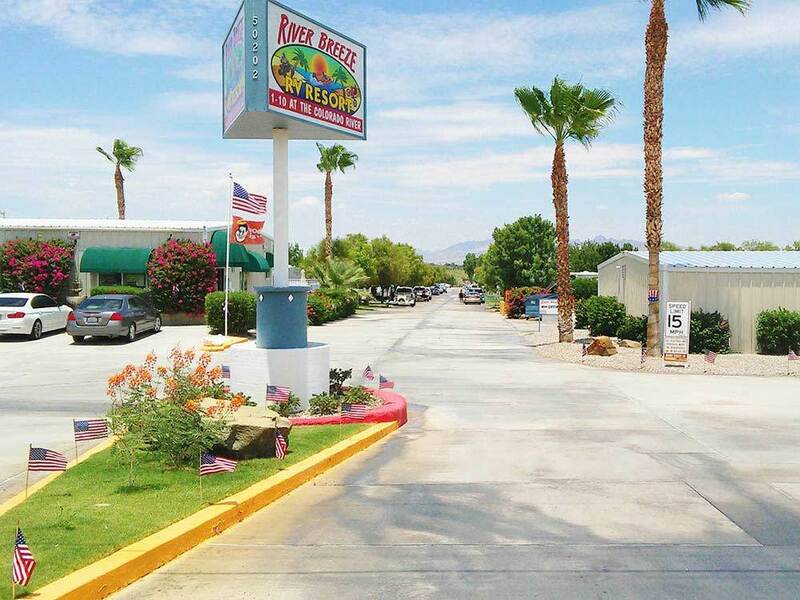 $40/night GS/Vets	Site C5 River Breeze is one of several RV parks located on the banks of the Colorado River just over the stateline from California. A cursory look at the other parks leads us to believe River Breeze is the nicest. The roads are paved and the sites are well maintained grass pull thrus. In January, the park was populated mostly by snowbirds here for the season. The rest of the sites by shorter stays and overnighters on the I-10 between Phoenix and LA. Park is very clean and well maintained and staff are super attentive and friendly. Water went out one day and staff had the broken pipe repaired in short order. Cable is available and wintertime sites were satellite friendly. WiFi free, but on the slow side.The park has a launch ramp and river access, but the river level was so low as to make it unusable (ask a local how they feel about Californians stealing the Colorado River water…) Ehrenberg has nothing much going for it. One small mini-mart and a couple of gas stations (but what a relief to pay $1 a gallon less than in Ca!) Over the bridge is the town of Blythe, Ca. Many, many fast food joints and a couple of decent Mexican (La Paloma and Garcia’s) places and an Albertsons and Dollar Tree…but otherwise a very sad town with over 50% of buildings boarded up and abandoned. It was a great place to stay overnight on our cross country trek. Good wide concrete roads with real grass and shrubs on the RV sites. It was right on the shores of the Colorado River with great views of the sunset. If you want to use their cable, make sure you get a cable box from them. Wonderful park. Wide grassy sites, beautiful river front and good management. Cable tv and adequate wifi. Nice little doggie park. Meticulous park, beautifully maintained, friendly, caring, dedicated staff, quiet, respectful fellow rv'ers. Highly recommend and will definitely return. In fact, looking forward to our next visit. Thank you to the park owners and staff for creating and maintaining such a beautiful park and Riverside experience. River Breeze is an absolutely, awesome RV Park. Wonderful customer service. We loved everything about our experience here. We'll definitely come back. Lovely RV park close to Quartzite. Spaces are large and grassy. Good internet, heated pool and hot tub. Boat ramp on river. This park is a gem and we plan to return. The park is very well maintained, clean and quiet. The staff are pleasant and professional. We have stayed here a few times and have had a wonderful experience each time. Always clean. The property is beautiful and well maintained. Good access for both winter and summer toys. Friendly staff.